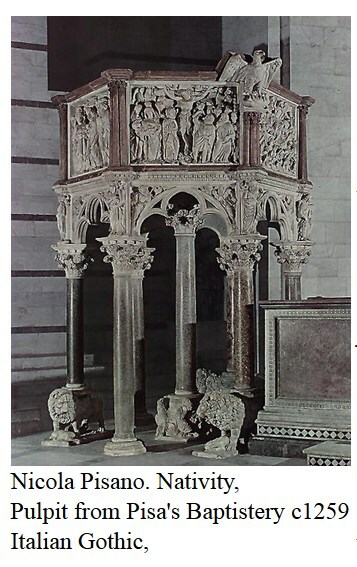 Form: This pulpit exhibits qualities from all three of the eras. The ornate carving and stylization of the lions and the lions demonstrates both the influence of the Byzantine and Gothic eras. The classical columns surmounted by Gothic style tracery show those periods styles. 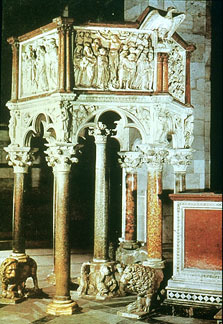 Iconography: This pulpit is the podium from which the priest or brother who resides over the ceremonies and services speaks from. As such it is elevated as his words must be but the decorations and ornamentation are also iconic of the priest's words and his status. The references to both the classical and gothic styles also lend the work some authority as well. The sculptures of the eagle and lions at the base have some basis in earlier traditions in which lions and monsters serve an apotropaic (protective) function but in this case, it is possible that the lions could refer to the story of Daniel in the lion's den or to a passage from the the 95th Psalm. Form: This is a relief carving. The relief varies greatly in the height and or depth of each of the figures and objects. In general the composition is fairly symmetrical yet it is very crowded and almost seems disorganized. Most of the figures are placed in the foreground of the picture plane and the space created is not very illusionistic. Space is created by placing the figures in the foreground lower in the picture plane. In order to show the recession of space, the figures are layered and the placed in a vertical perspective. The rendering of each of the figures is fairly naturalistic and the clothing, drapery and poses are somewhat reminiscent of carvings such as the this one from the Parthenon's pediment. Several of the figures, such as the main one which depicts Mary and the child (Jesus) are repeated because several scenes are simultaneously being represented. This kind of continuous narrative is common in Byzantine, Romanesque, Gothic and Renaissance art. The next major difference is in the style and amount of artwork. In general, the Romanesque style is extremely organized, diagrammatic, and stylized. It tends to take cues from Byzantine art, in which the figures' relative size to another figure is based upon its' importance in the spiritual hierarchy. For example, when Jesus or an Angel is shown, they are relatively larger than all the other figures whom are depicted in a particular scene. This shows how important they are, they loom above the mere mortals, faithful and sinners alike. In contrast, the Gothic style of sculpture and art within a cathedral is very much a "schema and correction" of the Romanesque art. While the same themes and saints may be depicted, they are far more naturalistic, shown more or less in proportion often with detailed, flowing robes which hearken back to the Greek ideals of art and beauty. For example, in Stokstad on pg. 594, is a depiction of Dormition of the Virgin from the Strasbourg cathedral in France. Jesus, the virgin, and all the followers are all equal in size and proportion, the only thing that shows Jesus as the most important figure is his place n the center and his halo, otherwise he blends in with the others. There also tends to be more of an emphasis on the stories of Jesus in the Gothic cathedrals, whereas the Romanesque cathedrals tended to emphasize not only Jesus, but biblical stories, morality stories, saints, parables, and virtues. Context: The realism of her pose and drapery demonstrate the beginnings of the heightened realism that occurs during this period. These classical references are both "classy" but also refer to the new ideas concerning a more humanistic approach towards interpreting scripture. The naturalism relates more towards the viewer than ever before and it is possible to imagine the scene as something real. 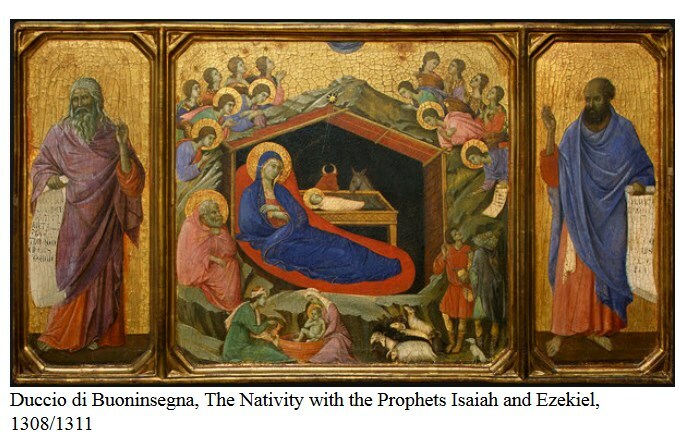 The iconography of Pisano's nativity scene is almost completely and exactly reproduced in this panel painted by a later artist named Duccio. 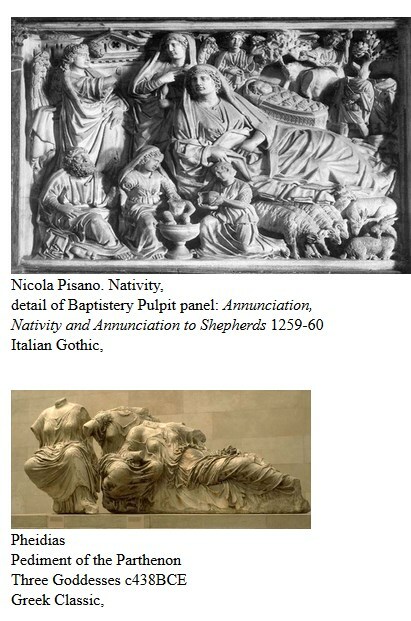 Form: The rendering of each of the figures is fairly naturalistic and the clothing, drapery and poses are somewhat reminiscent of Nicola Pisano's Nativity, from the Baptistery Pulpit panel and carvings such from the Parthenon's pediment. 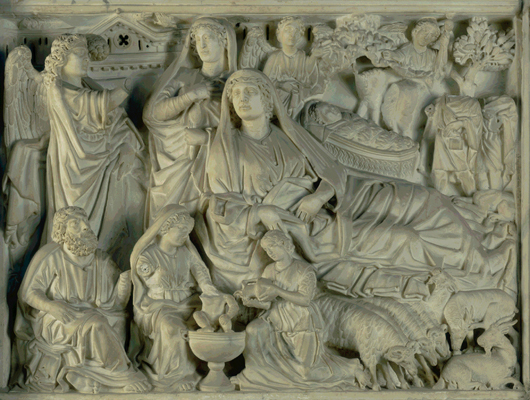 Several of the figures, such as the main one which depicts Mary and the child (Jesus) are repeated because several scenes are simultaneously being represented. This kind of continuous narrative is common in Byzantine, Romanesque, Gothic and Renaissance art. Iconography: This is a nativity scene that at first appears to take place in a manger but it also contains the baptism of Christ as well. The center of the scene Mary reclines in a pose very reminiscent of the Goddesses from Parthenon. In the lower left foreground of the image is the baptism of Christ. 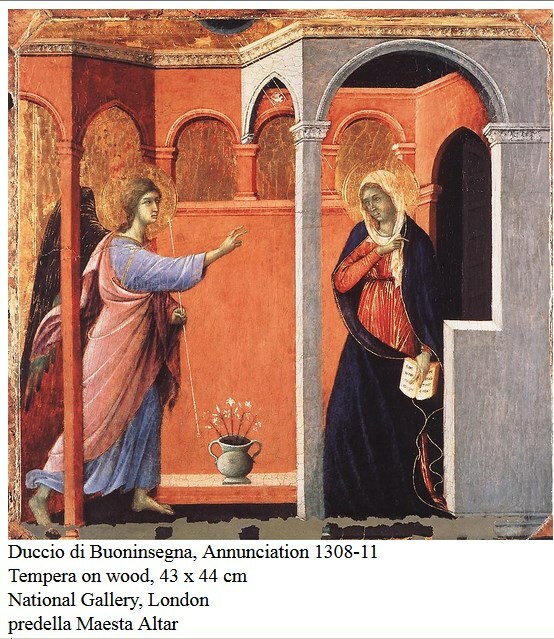 The figures that flank the main scene serve as a kind of framing device that also update the image and provide transitional figures that bridge the gap between Mary, Jesus and us. The image of the saint in Catholic art and religious practice is one that symbolizes our possibilities. The saints were normal people, who in their emulation of Christlike qualities show us what every person is capable of attaining. When Catholics pray to them they are asking for the saint to intercede with God. Basically ask God for a favor for us.